"Not a hotel. Not home. Better than both." McKinney Bed and Breakfast was named one of the Top 12 Best Bed and Breakfast Inns in America in 2016. And, this year, McKinney Bed and Breakfast was named by Reader’s Digest as The Most Charming B&B in Texas. The city of McKinney is a northern suburb of Dallas, Texas. The west side of McKinney is filled with grand Texas homes! The east side is the historic downtown neighborhood and square, with over 120 stores and restaurants (housed in the original buildings from the 1800s) all just a couple blocks from the bed and breakfast. There is live music on the weekends, wineries, festivals throughout the year, food tours, architectural walking tours, ghost walks, carriage rides, and a busy weekly farmer’s market, and large monthly vintage and flea markets that bring people from all over the country. There are over 20 wedding venues all within a 25 mile radius of downtown McKinney. In 2014, McKinney was named Best Place to Live in America by Money Magazine. Consequently, large corporations (such as Toyota and Fed Ex) have recently made the McKinney area their corporate home. The city of McKinney is less than 40 minutes from 2 international airports, and has a growing national airport of it’s own as well. There are 4 national sports teams all within 50 miles of the BnB, and over 30 colleges and universities. Throughout the years, guests of McKBnB have come from all over the world. The BnB also sees a very large percentage of “local” guests who come in for just a night or two to celebrate a birthday, anniversary, or a romantic getaway from the kiddos. Due to perfect reviews on Yelp, and it’s 5-Star Trip Advisor rating, McKBnB has a wonderful repeat guest rate, and rooms are generally booked out 3-6 months in advance, depending on the time of the year. The current owners did all their reservation booking from 2012 to 2016, and then went to online booking with Think Reservations. This is not a seasonal B&B, and if wanted, owners could potentially work 365 days a year, as the Texas weather is seldom prohibitive for guests. The charming house, originally built in 1880, (and tripled in size in 1990) features a wrap-around porch surrounded by a colorfully landscaped yard. Just off the porch, adjacent to the front door, is the private keyed entrance to one lovely guest room/bath. Newlywed guests and first-time B&Bers love the private entrance! Inside the main entrance of the house is the staircase to the upper floor, and the common guest area. This living and dining area is comfortable, well-lit, and freshly painted in soft grays and whites, with large windows and floor-to-ceiling white curtains. Off the entry is a french door that leads to another beautiful guest room and bath, with huge windows looking out to the side garden. A gorgeous sliding wood and glass door (curtained) separates the downstairs common guest area from the kitchen/den area, which is over 400 square feet, and was completely renovated in 2016. It is bright and sunny with lots of large windows, tons of storage for the busy B&B chef (35+ cabinets and drawers) and a gorgeous 4’x8′ granite island with double sink and dishwasher. Within this area is the enclosed laundry room, and a beautiful eating area for owners to enjoy, along with the access door to the double garage, and the cottage. If new owners want to do cooking classes or open the kitchen up to guests, just slide the beautiful door open, lose the curtains, and you now have a kitchen and den that guests can access. The beautiful two-level staircase just inside the front door leads to the 2 larger guest rooms. Both of these beautiful guest rooms have their own full bathrooms, and can potentially accommodate extra beds. Both spacious rooms feed into a small sitting room which is lofted beside the stair case. One guest room at this level has a private spiral staircase to the backyard of the main house. This room, the largest in the house, is used privately by the current owners, and still could be used as such, though adding it as a rentable room will increase the revenue substantially. It is a unique room with tall angled ceilings, a wood-burning fireplace with huge hearth and mirrored mantle. The well-lit bathroom to this room is 13×17′ and has a separate garden tub and large shower. There is a giant walk-in closet off the bathroom as well, and access to another attic area. The backyard alone boasts over 40 varieties of trees, bushes, vines, and flowers and has a covered back porch, a landscaped courtyard, a large private wooden deck for the owners’ enjoyment, a lovely iron gazebo, a fire pit patio (just behind the cottage) and a pass-through side garden with iron arches, vines, and trees. The cottage, built in 2014, has 9′ ceilings, kitchen, bath, & lots of big windows. Presently, it is occupied, but is the perfect configuration for an owner’s quarters, as it is just behind the main house, connected via a covered breezeway and the courtyard. *All appliances, dish-ware, linens, and guest beds are included. Most other furnishings are negotiable. Full financial disclosure and detailed books are available upon request for serious buyers. Owners are selling to start another successful BnB in the Smoky Mountains! 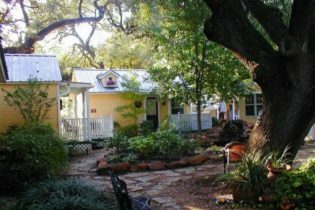 Romantic Cottages surrounding a beautiful courtyard with koi pond and waterfall under live oak trees. 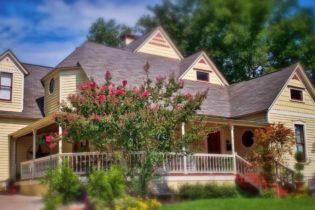 Very well established Bed and Breakfast – one of the busiest in Granbury! The cottages are very easy to sell as they offer privacy not available in a one house B&B. Also pet friendly and child friendly so that provides more bookings also. This has been a B&B for over 20 years so it’s very turnkey. The courtyard is beautiful with a Koi pond and waterfall.